Pyramid Poly White is designed for maximum opacity on bleed resistance poly/cotton fabrics. It has maximum opacity, with excellent matting characteristics combined with a smooth, creamy consistency making it ideal to print with. Poly White has been designed to print with using both manual and automatic screen presses. 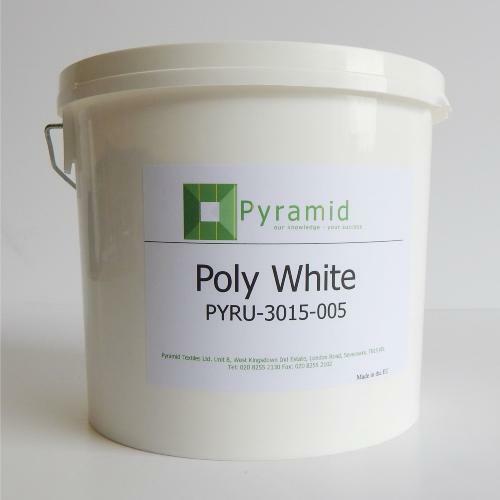 Pyramid Poly white is fast flashing, allowing for shorter dwell times and faster production rates. It works well for highlights or as a stand alone white. Designed to be printed through mesh counts ranging from a 34T - 77T, the use of a firm squeegee will cut through this ink and deposit a nice smooth layer, with good resistance to the potential problem of bleeding. This premium product in our range, which unlike some low bleed/poly cotton products, does not contain puffing agents to hide the dye migration but utilizes a range of very specific plasticisers and resin blends to achieve a strong, consistent, low bleed White.